At the age of five, my daughter Allison was diagnosed with Kawasaki Disease. Like many other KD parents, her mother Jean had to become relentless in her pursuit of a diagnosis when initial visits to various pediatricians came up empty. Luckily, Jean found a pediatrician who had encountered KD before (her nurse’s daughter had KD many years ago), and they ended up at Children’s Hospital Boston with KD expert Dr. Jane Newburger. Unfortunately, the diagnosis and initial IVIG treatment came too late, and Allison was left with giant aneurysms. 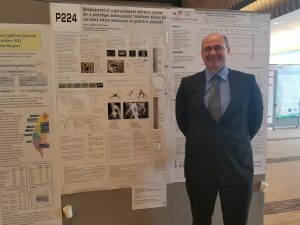 Aubry Shackelford poses with his poster presentation at the 12th Annual International Kawasaki Disease Symposium in Yokohama, Japan; June 2018. Jean and I turned to Allison’s Uncle Dave, a medical device developer with broad medical knowledge, for help in translating the details of what could be expected down the road and what alternatives were available for treatment. While there are medications for controlling blood clotting, there seemed to be nothing available to prevent the likely occurrence of a stenosis – the restriction of the coronary arteries that deliver oxygen to the heart muscle. In this case, the primary treatment currently available is to perform a bypass surgery after the stenosis occurs. With a background in engineering myself, I was hoping to use that to develop an alternative treatment that could heal an aneurysm in cases like Allison’s. I teamed up with Dave to form Pegasus Therapeutics, a company that is currently exploring potential technology that could be used. Spring-boarding off of a crowdfunding campaign to pay for equipment and materials, we are currently working on a medical device, called the bioresorbable flow diverter, that borrows from state-of-the-art brain aneurysm treatment and coronary artery stenting technologies, and have received the designation for a humanitarian use device from the Office of Orphan Products Development (OOPD) of the US Federal Drug Administration (FDA). 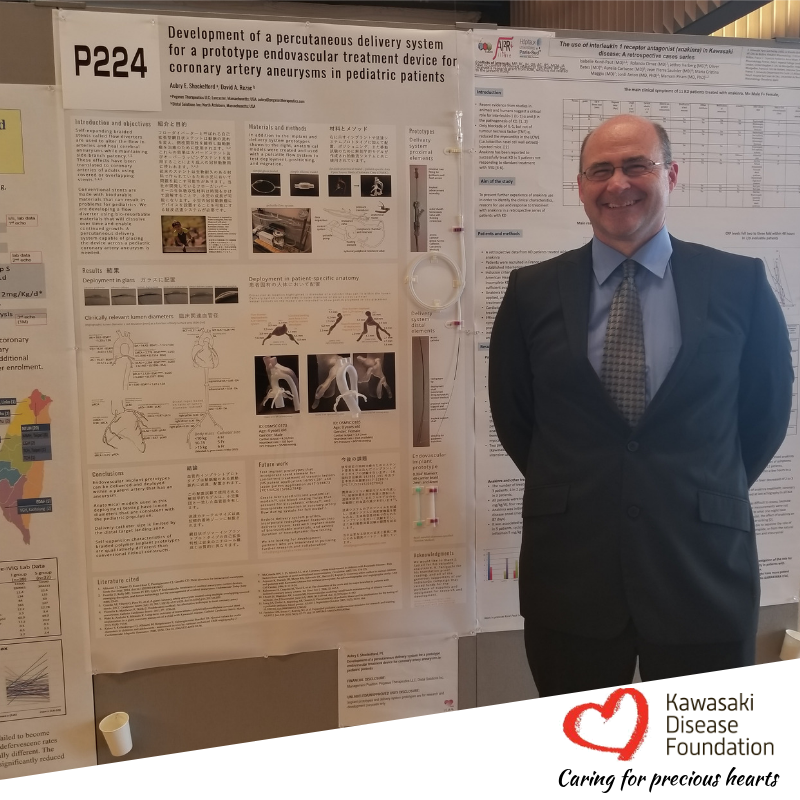 At the recent International Kawasaki Disease Symposium in Yokohama, Japan, I presented the results of our work on the development of the prototype medical device. While there is still a long way to go in development, many pediatric cardiologists and researchers from around the world who attended were encouraged to see the work being done in developing alternative treatments. As parents, we want to help not only our own children but also others potentially affected by KD to the best of our abilities, and that can take many forms – whether advancing medical technology in treatment and diagnosis, helping parents and children understand and deal with their new situations, or raising awareness of the disease itself, we all can contribute and make a difference.